Hands-down one of the quickest salads you'll put together this Christmas and one of the tastiest. An excellent marriage of crunch and sweet and salt and soft, all covered in manchego cheese snow. 1. Whisk the dressing ingredients together in a bowl and set aside. 2. 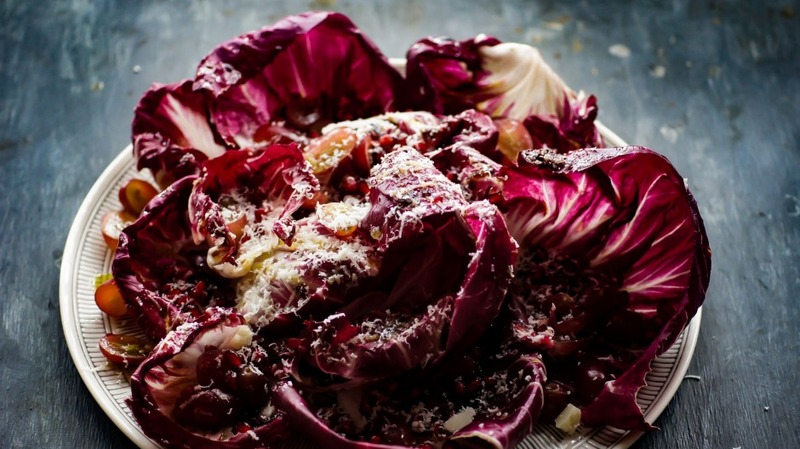 Spread the radicchio leaves on a large serving platter. Top with cut grapes, onion and pomegranate arils. Season generously with salt and pepper. 3. Spoon over the dressing, enough to coat the salad here and there in pockets of balsamic and oil. 4. Using a microplane, grate the manchego generously over the salad and serve immediately.